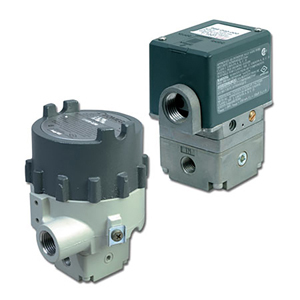 The IP510/EP510 Series are a patented family of electro-pneumatic instruments that are used to reduce a pneumatic supply pressure to a regulated output pressure which is directly proportional to a two-wire current or three-wire voltage input. This design incorporates closed loop sensing of the output pressure to achieve excellent accuracy and vibration stability. They also feature a unique damping circuit which can be adjusted to prevent overshoot and actuator hunting. Model selection includes General purpose NEMA 1, and Water-tight/Corrosion Resistant NEMA 4X (IP65). All models carry Hazardous Locations and intrinsically safe ratings. * For models with zero output capability maximum supply pressure = 40 psi (2.8 bar) above maximum output, except for 0 to 100 and 0 to 120 psi models that have a maximum supply pressure of 130 psi (9 bar) and 140 psi (9.7 bar) respectively.